I thought long and hard about a way to share something from my art and illustration process with my readers. I wanted something that could maintain a connection with those who enjoy my work. I wanted something that would open a tiny window into what goes on at my art desk each day. Art journaling has grown immensely in the last few years. Art journals take different shapes and forms, cover a variety of themes and purposes, but they all share something unique from the author’s imagination and creativity. I have decided to embark on a daily project to share a “doodle” per day. These doodles can be integrated into art journals as backgrounds, borders, lettering, or even as main elements. As an artist and illustrator, I spend a lot of time “doodling”. It helps me relax, lets my creativity spill out onto a piece of paper, and gives me the time to think of what I will do next. 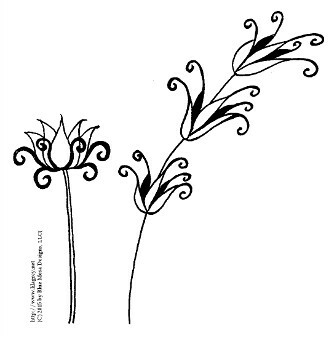 Today’s doodle was inspired by a couple of dried weeds I saw on the side of a trail. Even as winter calls and plants wither, nature has a way of showing us something beautiful. I hope you find this series inspirational, and that you too think of creating your own doodles each day!